I’m not sure why but every time I go out for breakfast, which really isn’t that often, I always drool over the breakfast skillet. 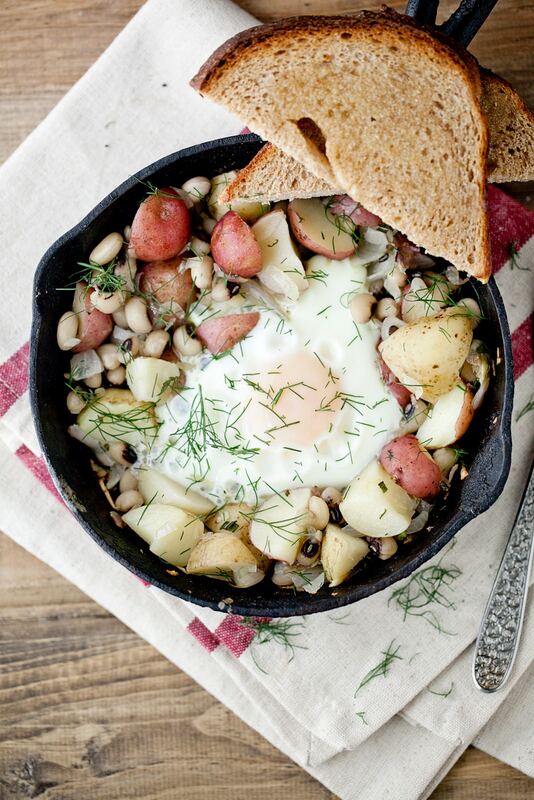 There is something so delicious about potatoes, eggs, and veggies thrown all together and cooked. It’s comfort all in one dish. Yet when I order one (that is, if I can find one without meat), I’m always left slightly disappointed at the general over saltiness, abundance of grease, and lack of flavor. 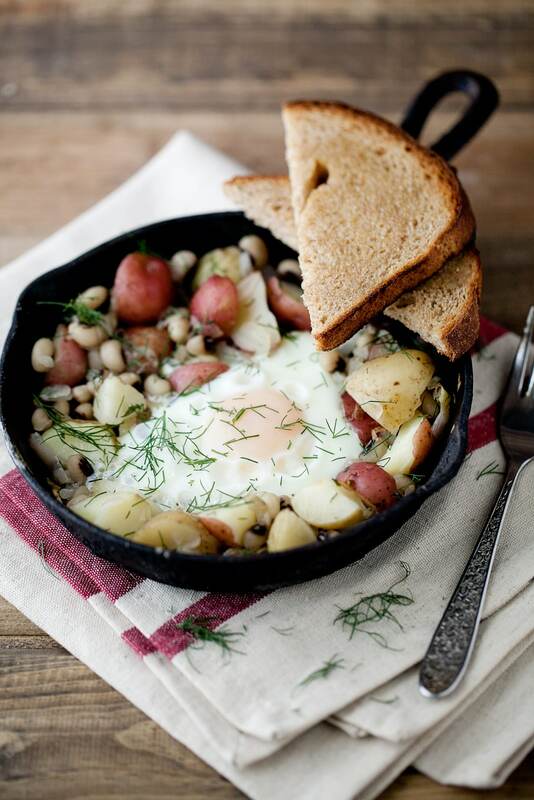 As long as you watch your ingredients, this meal is easily gluten-free plus you can make this meal for yourself or for your entire family by using multiple cast iron skillets or one large one. I think this would also be an amazing breakfast for camping and once temps cool back down, I will be trying it! This looks so, so, delicious! Yum! last friday, i made a shopping list before setting off to the farmers market. potatoes were one of the things on my list. when i got to the market, i realized i forgot my list. i tried my best to remember what i wanted and when i got home checked with my list. what did i forget? the potatoes! they do get thrown by the wayside. i have an overabundance of zucchini! love this dish… heavy, comforting, and delicious! Sooooooo purty. I want 16 servings. That looks amazing and I’m totally going to make this! Thanks for sharing! This has always been my favorite, and go-to breakfast option when eating breakfast out. But yes, the heavy, greasy, meat-laden skillets must be a thing of the past. I do love making them at home too, with anything leftover in the fridge. My current love was a Three Bean Chili that I scooped the solids out to simmer before dropping an egg in the middle. 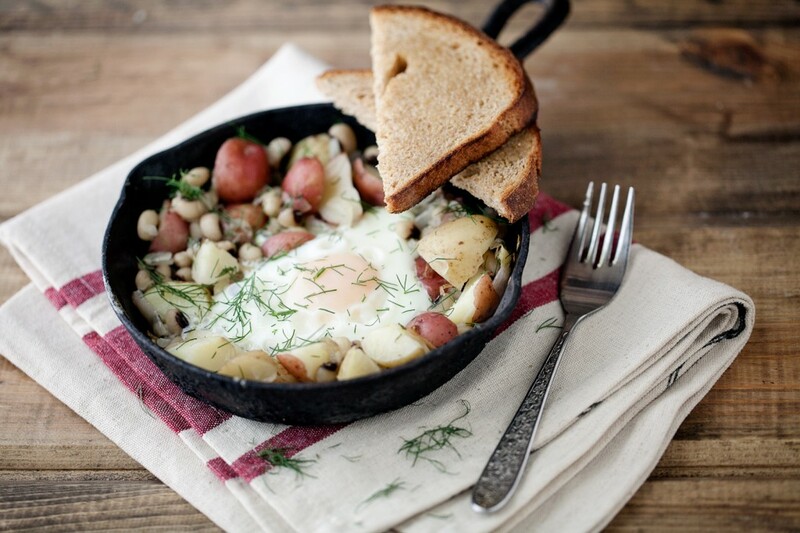 I may have to try this one though, as there is nothing better than spuds for breakfast. Looks great! If you have a ton of dried dill instead, how much should you use? Thanks! I would say a teaspoon or two! This looks so good, Erin. I love potatoes at breakfast. And eating a greasy breakfast is always fun until 3 bites in. Then regret sets in. So thanks for a healthy version. I just made this and it was AMAZING. Only think I did different was add some diced jalapenos. So. Good. Yes! I’m so glad you liked it and I love the addition of the peppers- I think I am going to try that next time! I love a good hash. Love the addition of dill and black-eyed peas. Yum. This post also makes me think that I need a cute mini cast iron skillet! This looks like a lovely Sunday breakfast – yum! This was great! Substituted the black eyed peas for some of the buffalo crumble and it was a great combo. The dill and rosemary were great together. Thanks for an amazing recipe! Had a bumper crop of self-seeded dill that I had to pull to prep the garden to plant-thanks for a recipe to help use it in large quantities! Delish!